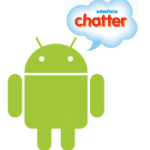 Salesforce.com invited me to attend Cloudforce last Tuesday to demo my Salesforce Chatter for Android app. The reception was incredible and there is a big push to get a Salesforce.com app running on Android. Parker Harris (Co-founder & EVP, Technology) even made the statement in the keynote that, "I do have a team working on a native Android Chatter application that will be out later this year....". Well that created a lot of buzz so over the last couple of days I've had an amazing number of people email, tweet and post chatter asking me how people can run the Chatter for Android app on their own phones. I checked with Kris Muller at salesforce.com and we've decided to let anyone install the app and try it out. The functionality is limited (you can only view the Chatter feed and post an update) and it is connected to a DE org so you can't really screw anything up. If you install the app, please drop me a line and let me know what you think of it and if you have any suggestions. So here's a little background and how it get started. The application is combination of the Force.com platform, Google App Engine and a Google Android mobile handset. It utilizes Force.com Remote Access Applications with 3-legged OAuth for security allowing App Engine to fetch chatter feeds and post new status updates using the Force.com Web Services Connector running on App Engine. The Google App Engine app runs at https://chatter-android-demo.appspot.com. The Android client makes a request to refresh it's chatter feed and makes a call to this endpoint on App Engine. The WSC queries Salesforce for the chatter feed and returns the feed as a series of JSON objects. The Android client consumes the JSON objects and stores them in the local SQLite database. When the feed list is displayed on the Android client, the images are download lazily from App Engine when needed. You may see a slight lag while new threads are spawned and the images are downloaded. If the images do not display quickly, try scrolling through the list back and forth for them to display. Part of the roadmap is to store these images in the local database instead of downloading them each time. Long press the app and select "Install this apk"